Although I’m saddened by fall coming to a close here on at the High Line, the other gardeners and I are already looking forward to and planning for the upcoming season. In fact, some of this planning began back in August when we placed orders for our spring bulbs for 2019. 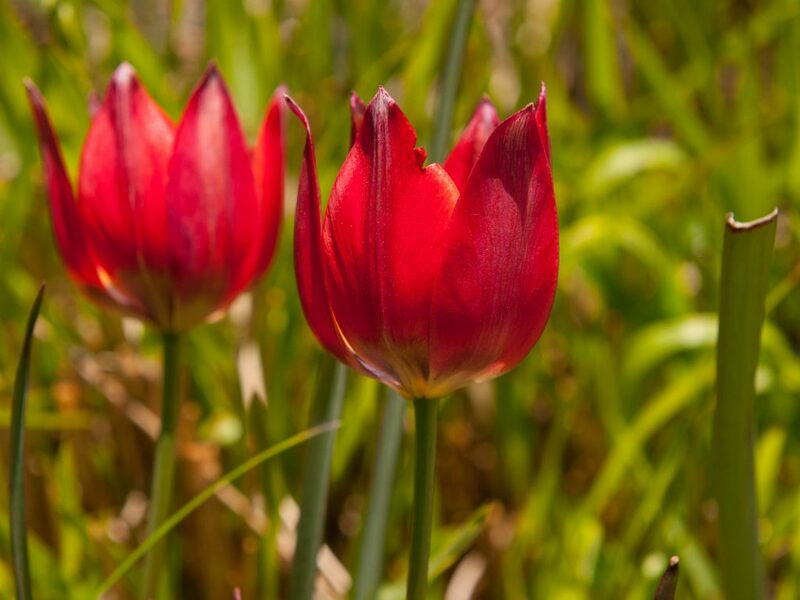 Over the next few weeks you might spot a gardener or two rummaging around in their garden looking for the best spots to plant these bulbs to create a stunning spring display. At the High Line, we leave dormant plants in place throughout the fall and winter, which creates spectacular fall and winter displays. Unfortunately, these spent plants can complicate bulb planting, since the gardeners have to move around and underneath very full and delicate plants in order to get the bulbs in the right place. We find the right places by keeping well noted and documented bulb maps from the previous spring. 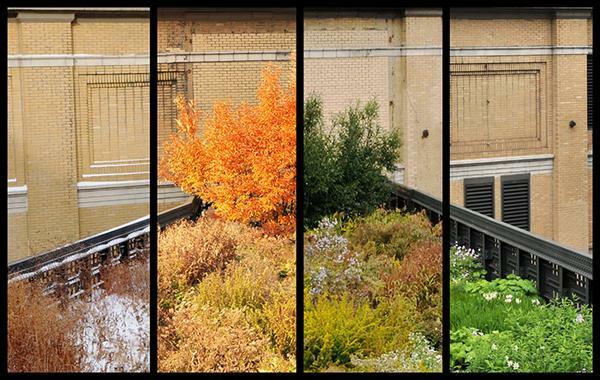 If you’ve visited the High Line enough, you know that one section, even just a block of the garden, can look completely different from season to season. Such is the intention of the four season design. This is why photographs, drawings, and notes are fundamental to the planning and design of our areas. Each one of us has different systems that work for us in terms of note taking and color coding, but we all start with a blank map of our beds and fill in the information from there. Yuki, one of our gardeners, is well known for her beautiful bulb maps as seen below. 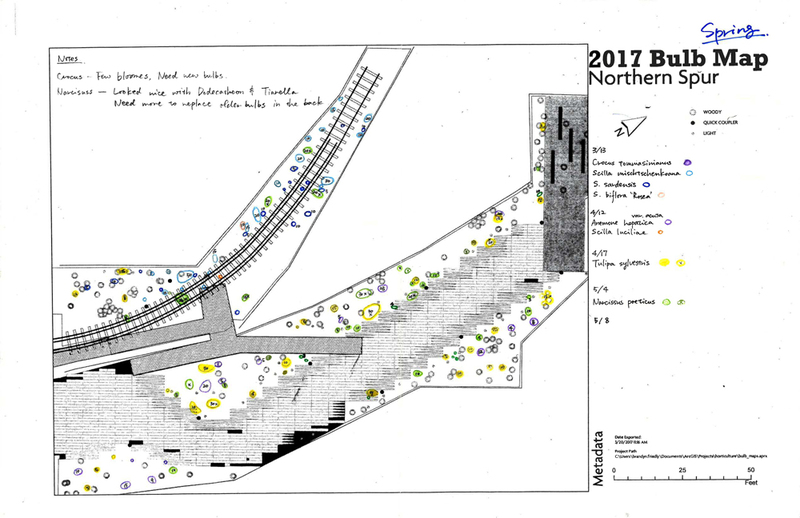 Documenting bloom time, conditions, location, and numbers from the previous season provides the information we need to make our design decisions for the following season. For example, I have eight different types of bulbs in my garden, five of which are quite abundant. Two of them, one tulip and one allium, are not as plentiful. So this year, I decided to only order those two bulbs to increase the ratio of those bulbs to the other six. I’m planning for not only a more floriferous show, but also a slightly different look, as these two bulbs will provide more red and white color. Bulbs can succumb to rot if they are too wet over the winter, so I hope the High Line’s fine sandy loam will drain quickly enough to keep the bulbs dry and healthy. These colorful visions of the future are something to look forward to as we face the long, cold winter predicted for 2019. I can’t wait to see what the spring brings.